Now you have lost me, which post/link was that? You linked to a BP page explaining how to become Member, Regular etc., except you managed to hyperlink your post in green. It was frankly amazing. Genuinely! Maybe i might also be a winner for a change. Good luck to me. Now that is refreshingly honest! but guess what!!! You are NOT going to win, and do you know why??? Because you have NOT put an Avatar on your profile!!! except you managed to hyperlink your post in green. It was frankly amazing. Genuinely! As far as I know, it is no longer possible on the new platform to use colours or change font styles at all (which is a shame). i think it means "Training Liaison Officer "
Is that a drill seargent of some sort ? Just said in a PC way, perhaps ? 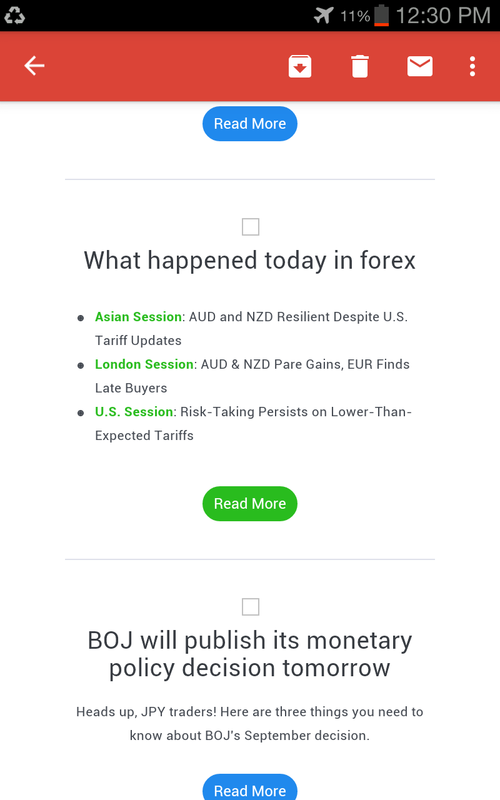 Babypips is the best site to learn forex. I learned forex trading in your Pipsology School. In fact, I studied every lesson and passed every test. I saved my exams results (scoring) in my profile. But I can’t see them now, due to your new design! One of the many reasons I love Babypips is your great sense of humor: I found myself laughing loudly several times when studying your lesson (people thought I was watching some funny video or crazy jokes!). I think your course is the funniest and most humorous online course of every kind I have ever found. It was enjoyable and funny to study your lesson. In fact, it is the single one online course I have ever taken and finished. After finished Pipsology by 2013, I kept studying and learning, but I never purchased a paid course or paid for mentoring. Now I am quite profitable. 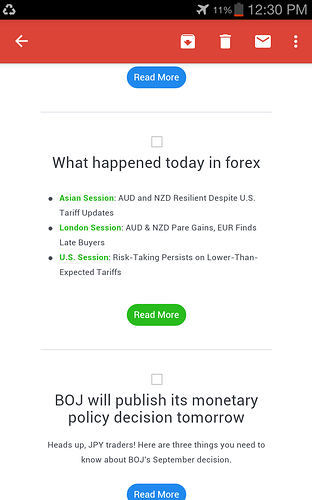 So, I believe (and I am the live proof of) we can learn Forex for free without purchasing a course, and without paying the so called “mentors” (just start by Babypips school), and Yes, we can be profitable and make money trading forex. I’ve entered please let me win. You still have a chance, post three meaningful posts to any threads that you want share or get help from + add your avatar (profile picture). Then you’re are in the list of waiting-to-be-lucky. Oh I almost missed this! I hope I win. Yes sir! We’re announcing later today!!! Again, for those wondering - this was a giveaway. This means the winners were picked randomly. 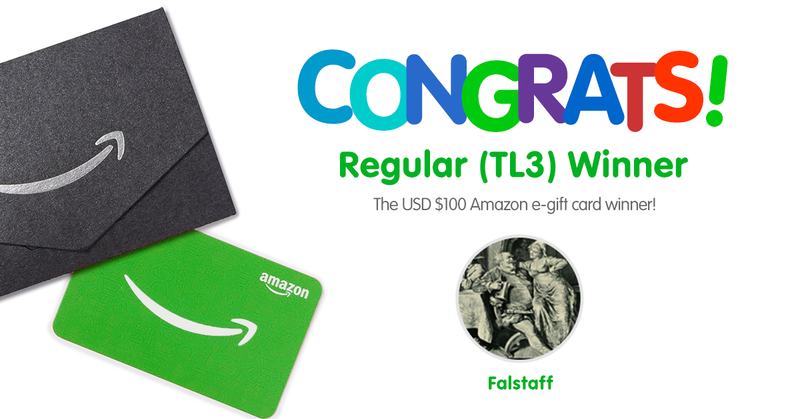 We had four separate data entries from each of the user trust levels (each post during the giveaway period was a single entry) and then we used a randomizer to select the winners. 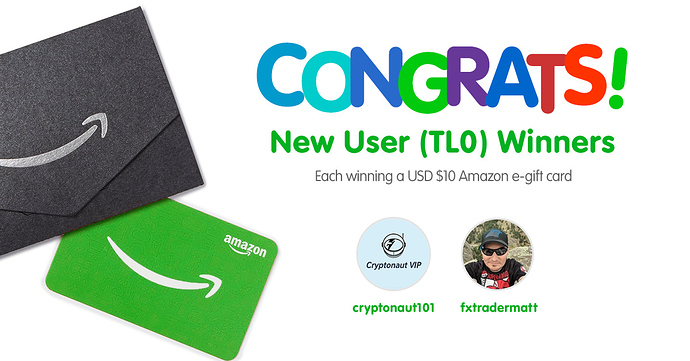 Remember, the winners needed at least 3 posts during the giveaway period, a profile photo, and a “Yes” to our poll! Starting off with the User Trust Level 0 or “New User” Category, the two winners, each receiving USD $10 worth of Amazon e-gift cards, are @cryptonaut101 and @fxtradermatt! 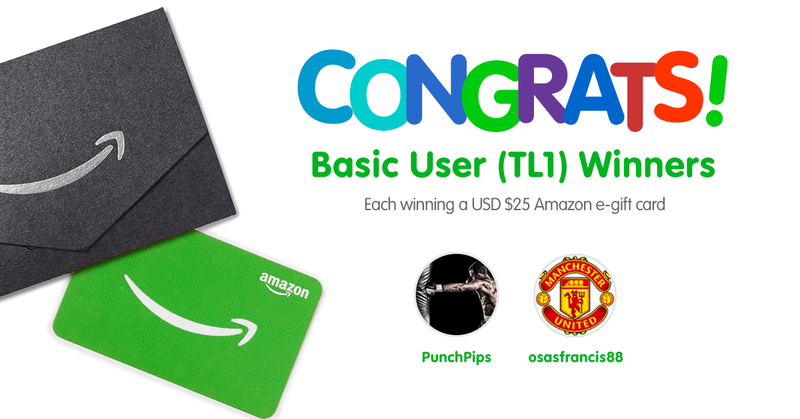 Now for the User Trust Level 1 or “Basic User” Category, the two winners, each receiving USD $25 worth of Amazon e-gift cards, are @PunchPips and @osasfrancis88! 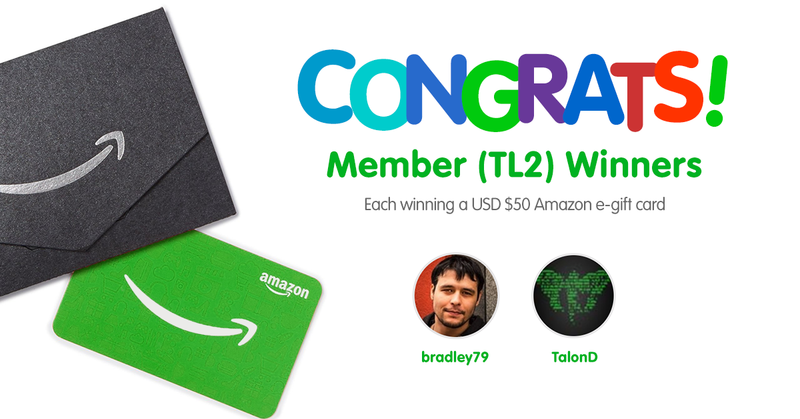 Moving on to the User Trust Level 2 or “Member” Category, the two winners, each receiving USD $50 worth of Amazon e-gift cards, are @bradley79 and @TalonD! Remember, you move up through User Trust Levels by reading and writing more posts, unlocking more badges - basically spending more time on the forums! You can read more about User TLs or Trust Levels here. To the winners, aren’t ya’ll lucky??? Congratulations again! I’ll be in touch with you guys shortly to ask for your email addresses! We will give all the winners 14 days to claim their prizes. If they don’t claim them within the next 14 days, we shall pick a new winner! So be quick and respond to my direct message ASAP!